A gunite swimming pool is part of the affluent Morgan Hill lifestyle, and homeowners have plenty of good reasons to choose Blue Haven Pools to build their private outdoor resort. Our bedroom community is not just where Blue Haven’s general manager Greg Jorgensen works; it’s where he makes his home and serves as an active member of our community. With nearly four decades of experience building custom pools & spas all over California, Greg brings top-flight expertise to every backyard makeover he manages. He served 19 years managing construction for Anthony Pools all over the Golden State, and he is about to celebrate his 20th anniversary as a member of the nationwide Blue Haven family. 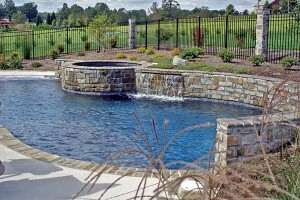 Dedicated only to Morgan Hill pool buyers, Greg personally supervises each and every pool he builds for his neighbors. He will be the individual who develops your project design and reviews all contract details and prices. And once construction commences, he will oversee every crew and specialty contractor who works on your pool. 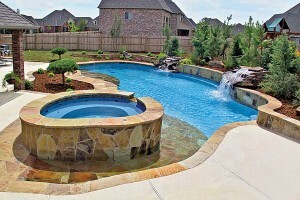 Building an inground pool is an intricate, step-by-step construction process, and everybody loves to see it go smoothly and quickly. Blue Haven Pools in Morgan Hill usually completes work in nearly half the time it takes local competitors. Greg explains the key reasons why he can achieve this speed. First, he accepts only a limited number of projects each year. He does so to ensure a high level of quality control and attention to detail. Second, Greg draws on his long relationships with his hand-picked crews and subcontractors, and he explains how doing so makes a major difference in the construction process. Given Morgan Hill’s proximity to Silicon Valley, many area residents who work for companies Netflix, Google, Facebook, and other tech firms want a state-of-the-art pool & spa for their home. According to Greg, that translates into pool buyers often asking for the convenience of automation and remote systems for their new pools. Indeed, with Blue Haven’s digital systems, you can put your aquatic retreat on autopilot and easily manage functions through a PC, laptop, or smartphone app. Environmental responsibility is also of interest to Morgan Hill homeowners. Many homes in our area already boast solar panels on the rooftops—illustrating how we care about conserving natural resources. The same goes for running pool & spa equipment, so it’s good to know that water and energy efficiency is a hallmark of Blue Haven’s private SmartFeatures™ collection. Our equipment options include energy-wise LED lighting, high-capacity filters that slash water loss, and two-speed pumps that turn over pool water faster to keep electricity costs low. 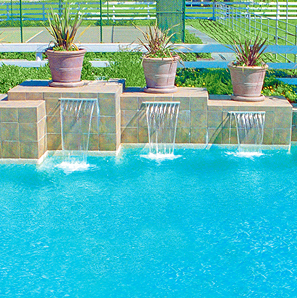 Other options for a healthier, more eco-friendly, pool include salt-water chlorine generators. 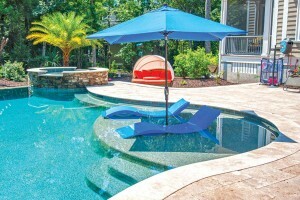 With our expertise and select equipment, Blue Haven is ready to help you design a pool and setting that turns your outdoor space into a staycation-worthy oasis. Please feel free to contact us and get the ball rolling on your new aquatic retreat! Morgan Hill’s Liquid Drama: Local homeowners prefer pools with design options such as water features, according to Greg. Sleek laminar deck jets and sheer descent cascades are among the favorites. 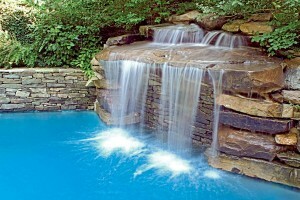 Rock waterfalls are also in demand, and our Blue Haven team has extensive experience building these custom creations.